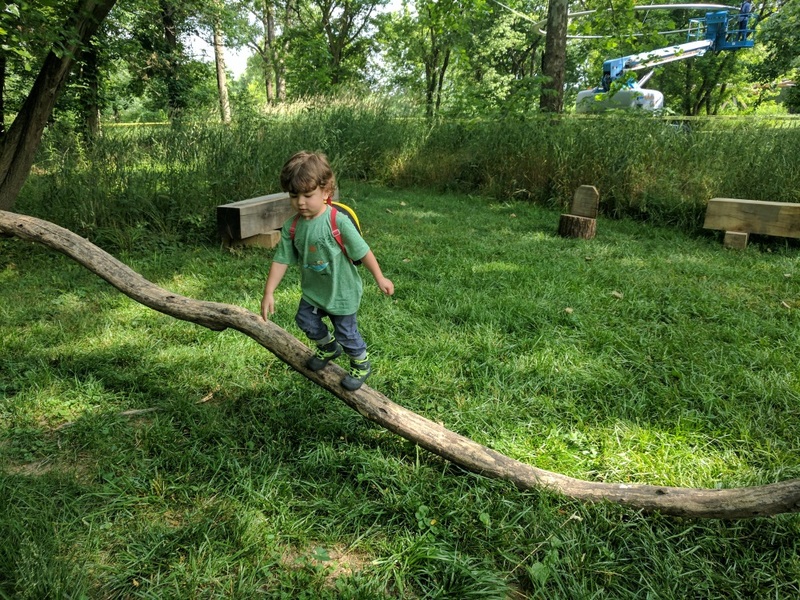 The Virginia B. Fairbanks Art & Nature Park: 100 Acres Art Park Trail, locally known as the “100 Acres Art Trail” is located right next to Newfields/Indianapolis Musuem of Art main campus. The trail runs through woodlands, wetlands, meadows, and wraps around a 35-acre lake. The trail is a loop that starts from the 100 Acres Parking lot and wraps around the lake. As of October 2018 it appears that the trail has been closed due to erosion. However, you can still access portions of the trail which run next to some fantastic grand art installations. The art is accessible and interactive; you can climb some pieces, touch them, play in them. Check out Funky Bones, the branch playset and more. Guided tours are available via Newfields. However, the park is lots of fun to explore on your own. Follow the yellow benches around the park. 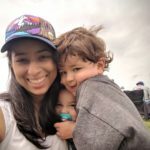 It’s a great way to motivate little ones and keep them moving. 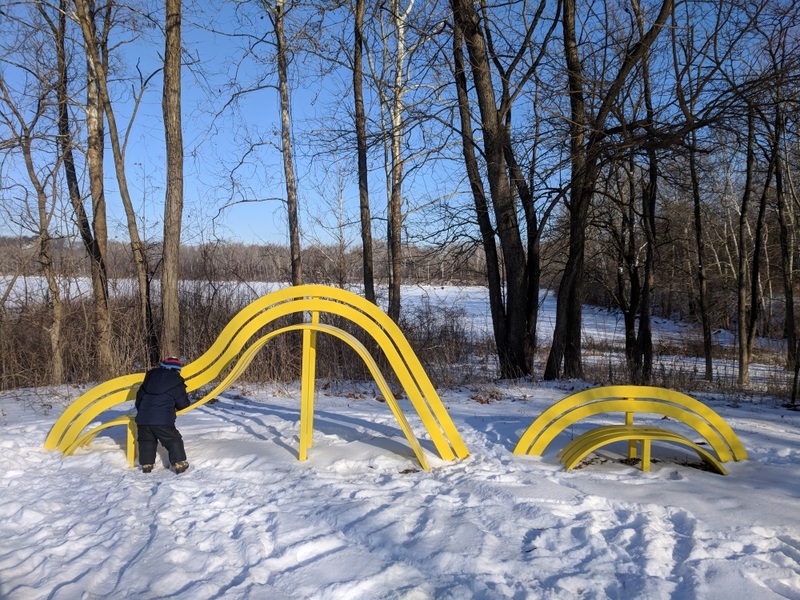 Each yellow bench has a unique arch form. Keep an eye out for wildlife too. The lake is a perfect spot to look out for herons and other birds. Take some time to interact with the art! The art is accessible and interactive; you can climb some pieces, touch them, play in them. Check out Funky Bones, the branch playset and more. Consider taking a picnic lunch and blanket. There are tables and plenty of grassy areas to sit down and enjoy a lunch in the spring or hot cocoa in the winter. Winter tip! 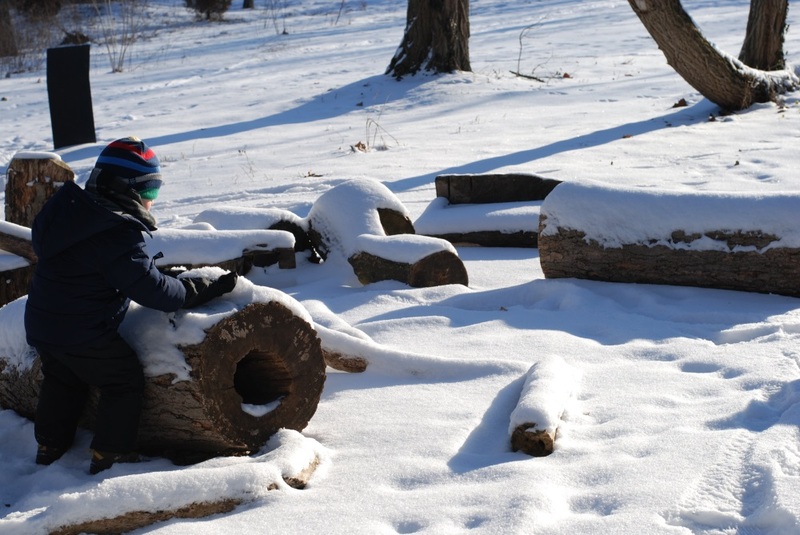 Take a sled to pull your little ones from art installation to art installation along the trail. Parking is free and right off the park entrance. A red and blue arch installation is located in the center of the lot. The lot has plenty of parking, even when heavily trafficked.